Todays #AdventWord in 2018 is #peace. It is also now Christmas Eve in the UK, so Christmas is almost here. One of the main messages of Christmas is 'peace'. 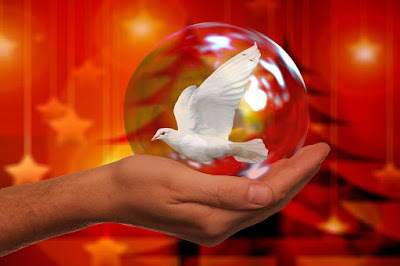 Many Christmas cards carry images of a dove of peace. Jesus is the Prince of Peace. He brings, not the sort of peace that is merely absence of war and conflict, but the deep inner peace that "passes understanding." Everlasting Father, Prince of Peace." (Isaiah 9:6). And yet, we have to go on asking, where is that promised reign of peace for all people? We have to live with the signs of peace now and the longing for the 'not yet' peace to come. 6 years ago on this blog, I posted a video that tells the story of Jesus' birth in Bethlehem. It brings the story right up to date, told in a beautiful and thought-provoking way. It is told by 21st century Palestinians of Bethlehem. Do watch it. It is well worth it. And may you know peace today.